Matt Murdock’s days might seem numbered but Marvel has already confirmed Daredevil will return to shelves next year. Marvel revealed the character will return with the relaunch of Daredevil #1 in February 2019 with the new creative team of writer Chip Zdarsky (Marvel Two-In-One) and artist Marco Checchetto (Old Man Hawkeye). The relaunch will follow the end of Charles Soule’s run and his final arc “The Death of Daredevil,” ending with Daredevil #612. The relaunch will also be preceded by a five-issue limited series Man Without Fear (January 2019), which looks at the fallout of Hell’s Kitchen losing Daredevil. 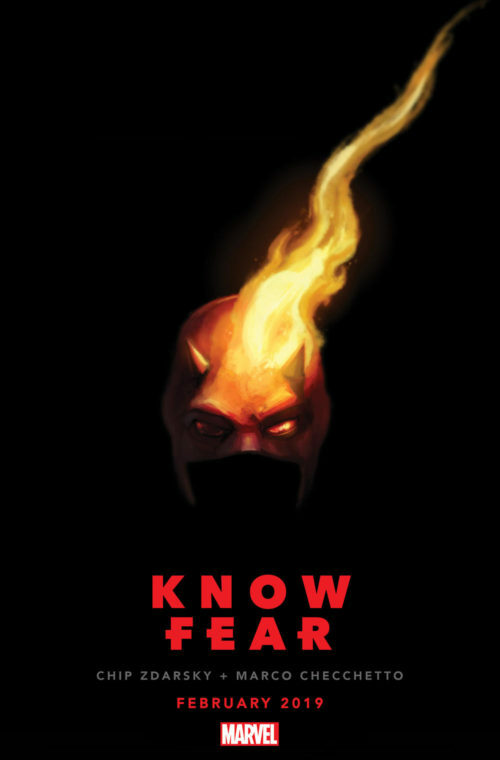 The teaser image for the new run uses the tagline “Know Fear” and shows the Daredevil helmet in flames. Zdarsky will be succeeding Charles Soule, who has written the character since 2015. Daredevil comics have a history of writers ending their tenures with a bang, and it seems like Soule will be no exception with Daredevil #612 being released as a supersized issue. Daredevil #612 goes on sale Nov. 28th. Daredevil #1 (2019) will drop in February.